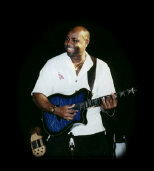 Roosevelt Walker, Jr. (Guitar/Back-up Vocals/Musical Director) My introduction to guitar was Christmas 1967, I got an electric guitar along with an electric train a basketball and some clothes. I can remember being very excited because the guitar was the only thing I had on my Christmas list that I actually got. My excitement was short lived, because 2 weeks after Christmas my 2 year old sister Jewell sat on the neck, when the guitar was lying on the bed, and broke the head stock off. I cried so hard that mom went to the store got some glue and tried to glue the head back on. Obviously that didn't hold under the tension off the guitar strings. Unfortunately Santa didn't have enough money to replace the guitar. But in the years to come I would play all my friends guitars as much as I could. I can remember some of them telling me to leave and go home and they wouldn't let me take their guitar, so I would stay and play until they kicked me out. In 1970 we lived in Salina, Kansas and I got the opportunity to play in the school band I chose to play the trumpet. I also played guitar in music class and that was pretty fulfilling even though I couldn't take the guitar home, I got to play guitar everyday for 40 minutes. I played trumpet for about 5 months in the school band and I was pretty good, I sat 1st seat. Dad was in Vietnam and Mom ran into some financial difficulty and couldn't afford to continue to pay for rental and I had to give up the trumpet, that hurt a lot. Didn't think much about playing music after that. When dad came home from Vietnam he brought me an electric guitar. I finally had my own guitar again, finally. I was determined to not let anything happen to this guitar. This is where my deep love for the guitar really started to develop. Lets jump forward a few years to high school. I thought I was a pretty good guitar player being self taught and learning some of the songs off the radio, until I went to Martin Luther King High in Phila. in 1975. King is where I started seeing some the funk bands in school, watching them made me realize that my skills were way down. At that point I started spending time every other day practicing. I couldn't practice guitar everyday because I was an athlete and played football, basketball and baseball. I had practice for these sports every weekday, as a matter of fact I was a better athlete than guitar player, I went to college on a full football scholarship, but that's another story. Back to King High. There were phenomenal players at King, some of the members of Pieces of a Dream, Kurt Dowd, Greg Thomas, Boneapart, Henry Horne, Tracy, Dale Harris and host of other great local players. I was surprised when a Greg Thomas and Tracey asked me to be in a new band they were forming called Retribution. I thought their skills were far beyond mine. The best part of playing with Retribution was that they added a second guitar player, Henry Horne, and Henry helped me a lot with some basic knowledge on playing in a band situation. I still keep in touch with all the members of Retribution today 27 years later.